More Photos to come! 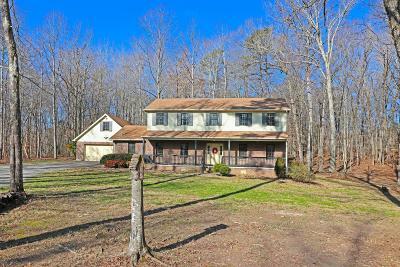 Total Privacy & Low-Maintenance Acreage! Less than 5 miles to Norris Dam, & Around the corner from Museum of Applachia. You must see this 12 1/2 acre wooded, gated & secluded homesite. Follow the winding 1/4 mile drive thru the front gate and pass the pond. Continue to the center of the property where you will pass the 900+ sq ft Barn (45' X 21') with new metal roof and concrete floor. (Could be an Event Venue!) The 3 bedroom, 3 bath house with a 2 car attached garage sits in the middle of the acreage. The inviting front porch leads you into the open foyer. The formal living room has pocket doors, perfect for a home office. Formal dining room has room for a large table to feed the whole family.